Muramasa: Blood Drinker, A Supernatural Mystery of Feudal Japan, by David V. Stewart is now available on Amazon in both ebook and paperback!“It is said that it is the destiny of good men to die young, to fall to the sword, and it is the destiny of wicked men to go on living. It is a cynical view; a false view, but not for the reason you think. The truth is, there are no good men. When you peer into the hearts of men, you will understand that they are all wicked, and they all fall to the sword. -The bandit known as Ryunosuke. The statement was believed to be taken down by a scribe in a small village north of Osaka, shortly before his death. The scribe, who was a visitor to the area, was known only as Takumi. His head was found neatly arranged on a bed of fresh white rice, as if it were a delicate sashimi. Ancient tales speak of a time when swords of great power forged by smiths of divine skill. Some of these blades, however, were cursed, hungering for death and sleeping only when sated by a feast of blood. This is a tale of one such blade. At the bidding of his lord, master swordsman Taoka Yoshio follows the bloody trail of a murderer who is seemingly empowered by sorcery. As samurai, Yoshio acts as retainer to the beautiful and enigmatic Amaya, the daughter of his sworn liege, on their quest. Amaya, however, has ambitions and plans that are quite different from the tasks appointed by her father. Along their way, they meet and befriend a legendary swordsmith, with whose help they begin to uncover the terrifying truth of the mysterious killer. 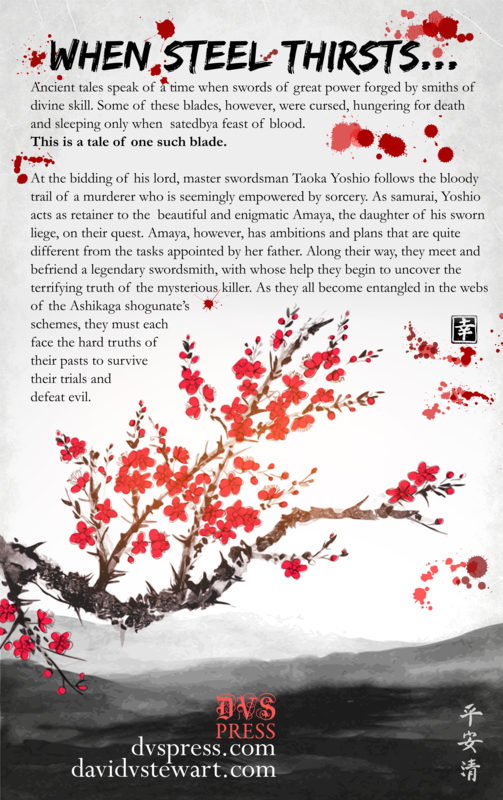 As they all become entangled in the webs of the Ashikaga shogunate’s schemes, they must each face the hard truths of their pasts to survive their trials and defeat evil. Muramasa: Blood Drinker is my third novel overall. It was serialized in 2014 between April and October and totaled approximately 116,000 words. Early installments were between 2,000 and 3,000 words and were published twice per week, with the final chapters moving to 1,000 words five days per week. After running on DVS Press and The Tears of Prometheus for two years, it was officially released on the Amazon Kindle platform in June 2016, at which time the fully indexed web version was removed. Thanks for reading! Muramasa was a particularly challenging and fun book to write. I hope you enjoy it! Due to the nature of this work as a serial release and because it is set in a place and time that may seem unfamiliar, I have created a list of the cast to aid the reader. This list is exclusive to the site. Minor Characters are in Blue. Asano Amaya – The enigmatic daughter of a powerful daimyo. 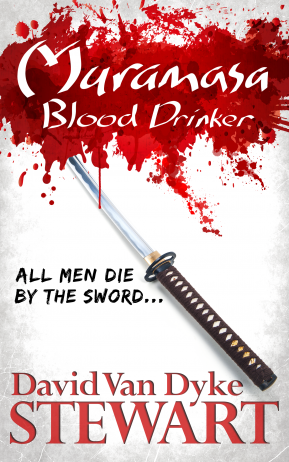 Taoka Yoshio – A skilled sword master acting as retainer for Amaya while pursuing a killer. 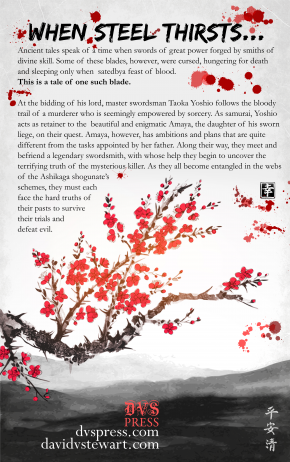 Ryunosuke – A mysterious killer who has harmed Yoshio’s former master. Kuramasa Kuro – A vassal of Amaya’s father and lord of a small fief northwest of Osaka. Kuramasa Reika – The wife of Kuro. Bako – The peasant overseer of the Kuramasa estate. Mitsuo – Kuro’s young retainer. Shiro – Another young warrior in the employ of the Kuramasa. Muira Minoru – merchant and money lender in a town outside of Osaka. Tetsuo – The merchant’s young apprentice. Muramasa Sengo – A legendary swordsmith on a quest to regain the sword which proves his reputation for making evil blades. Ashikaga Keiji – A son of the shogun who lusted after Muramasa’s swords. Shiba Masaki – A member of the powerful Shiba clan and man from Amaya’s past. Kyo – A middle-aged cloth dealer in Osaka. Minamoto Daiki – An aged relative of the emperor and Amaya who lives in Osaka. Tamotsu – A young retainer and duelist owing allegiance to the Hosokawa clan. Hayato – An experienced retainer and duelist owing allegiance to the Shiba clan. Emi – a young attendant at a Shinto shrine. Katashi – a young man who works as a guard in a gambling house. Ouchi Yoshioki – The Kanrei, or vice shogun, and respected battlefield commander. Furukawa Kenta – Yoshio’s feudal lord until his journey with Amaya. Yamada Nobuyuki – A feudal lord from Yoshio’s past. Toda “Tadashi” Yuu – Yoshio’s sensei, mentor and friend, he has a dojo in the Hida mountains. Goro Masamune – A legendary swordsmith and founder of the Soshu swordmaking school. Hikoshiro Sadamune – A student (and in this tale, son) of Masamune who continued on his traditions. Nobukuni – The descendants of Sadamune’s students at the Soshu school. Minamoto Shigeo – The nephew and caretaker of Daiki.